A prominent rock and metal band from the 70s, Thin Lizzy shot to the tops of the charts with hits such as “The Boys Are Back in Town”. Included in their repertoire is a cover of the traditional Irish drinking song “Whiskey in the Jar”, as well as other popular songs such as “Jailbreak” and “For Those Who Love to Live”. Widely regarded as one of the most popular rock bands in the world, a majority of U2’s band members called Ireland their home. They formed in 1976 and are from Dublin. A number of their songs have become international hits, including “Sunday Bloody Sunday”, “One”, “With or Without You”, and “Where the Streets Have No Names”. With over 170 million records sold, U2 is among the best-selling music artists in history, sharing the title with legends like Elvis Presley and The Beatles. Born in Belfast in 1945, Sir George Ivan “Van” Morrison began as the lead singer of Them in the mid-60s. He quickly branched out into solo work and rose to fame by 1967 with “Brown Eyed Girl”. When Moondance released in 1970, Morrison cemented his place in R&B forever. In fact, he still performs to this day. As of 2014, “Brown Eyed Girl” reached over 11 million radio plays, catapulting it into the top 10 songs of all time on US radio and television. One of the more recent success stories from Ireland, The Script epitomizes a brand of pop rock that has been especially popular in the United States. They formed in Dublin in 2001. Regular radio listeners will know them from their songs “The Man Who Can’t Be Moved” and “Breakeven”. So far, the band has received a number of prestigious awards, including two World Music Awards. Hailing from Northern Ireland and Scotland, Snow Patrol formed in 1993. They didn’t receive critical acclaim until signing with Polydor Records and adding Nathan Connolly in 2002. Their album Final Straw hit platinum in the UK in 2003 and they were catapulted into fame. With Eyes Open in 2006, Snow Patrol reached international recognition as everyone sang along with “Chasing Cars”. This single is Snow Patrol’s biggest selling to date. It broke into the UK Singles Chart and US Billboard Hot 100, peaking at number 6 and number 5 respectively. 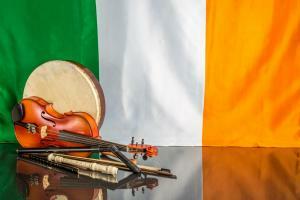 Whether celebrating your own Irish heritage or just enjoying some good music, these artists know how deliver.